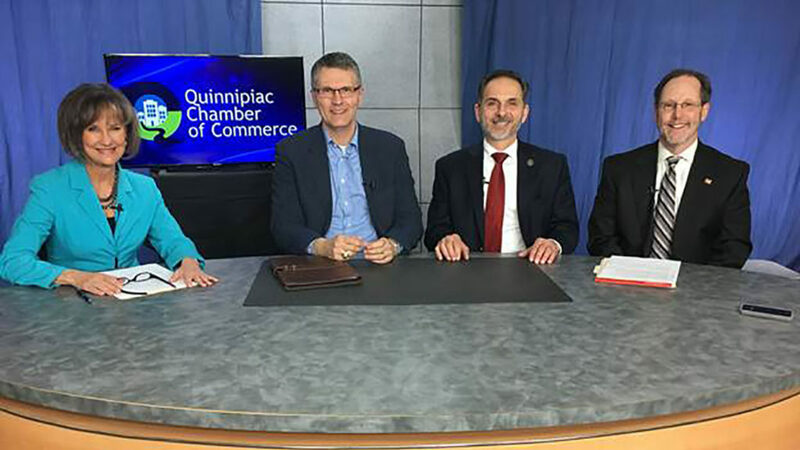 Dee Prior Nesti, Executive Director of Quinnipiac Chamber; Todd Arnold, Director of Connecticut Sequencing Lab in Mount Sinai Hospital; Dave Yaccarino, State Representative of North Haven; and Chris Porter, Legislative Chair of Quinnipiac Chamber of Commerce met on February 15 for a taping of “The QShow” to highlight legislative and policy updates. The segment will air on channel 20 in North Haven on public access television. Yaccarino discussed the governor’s proposal and its impacts on town and education funding, as well as some biotechnology and bioscience proposals, which he introduced this legislative session. Specifically, HB 6746 – An Act Establishing a Biotechnology And Bioscience Investment Tax Credit Program and HB 6760 – An Act Exempting Biotechnology and Bioscience Start-Ups From The Corporation Business Tax.